Sometime last year, Soulwax locked themselves into their DeeWee studio for a few weeks with the intent of twisting Pete Tong’s melon. Fresh from recording their one-take album, ‘From DeeWee’, the Dewaele Brothers weren’t content to compile a two-hour Essential Mix of other people’s tunes, so they set about creating their own. ‘Essential’ is the result. Carved out of the first hour of that set and committed to record, it’s a fairly technical exercise with each song based around a variety of voices saying the word “essential”. So where ‘Essential One’ crackles into chaotic life like an opening to a 2ManyDJs set, the slinking, Euro-pop of ‘Essential Three’ feels cool and clinical; where the futuristic tubular bells of ‘Essential Six’ clang and ripple, ‘Essential Eight’ has that trademark Nite Versions rhythm, zany melodies and pots ‘n’ pans percussion. 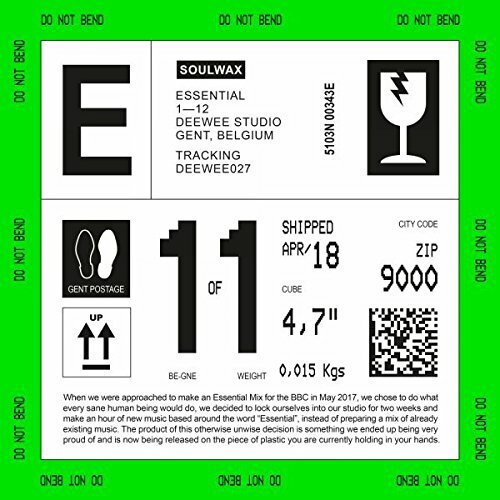 But underpinned so literally by this essential essence, the album feels like a disparate collection – a kind of electronic taster menu of Soulwax cut, chopped and re-rubbed a few different ways. Take the thesaurus regurgitation of ‘Essential Eleven’ and set it against the deep techno patience of ‘Essential Ten’ or the dark, acid squelch of ‘Essential Nine’ and one of those tracks always sounds out of place. In that sense, ‘Essential’ is less of a complete album and more of creative concept for a live set come to life. There’s enough to dip, cherry-pick and still turn up some serious dancefloor fodder but, as a complete collection, it’s literally Soulwax by numbers.